Earn 125 - 220 points upon purchasing this product. Use 1250 - 2200 points to purchase this product! Papaya leaf juice or carica papaya leaf extract (CPLE) is fast gaining importance in a world of nutrition for packing incredible health and skin benefits. Like the fruit, the leaf is rich in enzymes like papain and chymopapain, which aid digestion, prevents bloating and other digestive disorders. Apart from digestion, the strong alkaloid compounds like karpain works effectively against fighting dandruff and balding. Papaya leaves also contain high amounts of vitamins A, C, E, K, and B and minerals like calcium, magnesium, sodium magnesium and iron. A common remedy that is used for people who contract the dengue virus is papaya leaf juice. Dengue is caused by infected Aedes mosquitoes, who transmit the disease into the blood. Dengue fever severely brings down the blood platelet count, and the extracts from papaya leaf are known to help increase the count. (2011 study). Papaya leaves also have strong anti-malarial properties. A compound found in papaya leaf is acetogenin, which can help prevent dangerous disease like malaria and dengue. More recently Papaya Leaf Extract is also being used to help reverse the condition known as Chemotherapy-induced thrombocytopenia(see below). Caution: Papaya leaf extract should NOT be used during pregnancy. The active ingredients of CPLE are known to upregulate ALOX 12 and PTAFR genes which in turn are responsible for increased production of megakaryocytes and its conversion into platelets. Clinical evidence shows that CPLE increases ALOX 12 activity 15-fold and PTAFR activity 42-fold which is responsible for increased platelet production in patients with dengue fever and dengue hemorrhagic fever. Nutritionist, Dr. Sheela Krishnaswamy says, “Studies have proved that papaya leaf juice contributes significantly in the production of platelets and increase the platelet count. Epstin Barr Virus has been known to lower blood platelet count. Decreased platelet counts occur in 50% of cases of acute Epstein-Barr virus (EBV) infections. However, it is extremely rare for platelet counts to decrease to levels below 20,000 per mm3. Platelets are colourless blood cells that assist in blood clotting by forming plugs in blood vessel holes. Because each platelet lives only about ten days, normally the blood platelets are produced in the bone marrow. Decreasing of platelets occur due to trapping of platelets in the spleen or increasing destruction of platelets. A healthy person has between 150,000 – 400,000 platelets per micro litre of blood. However, chemotherapy, radiotherapy, dengue fever, chronic hepatitis, viral infection or imbalance in the immune system can cause a sub- normal platelet count. If body suffers from low blood platelets counts then it might be at risk, if it has a cut or a break on the skin. If body has a sufficient number of platelets then they are at a lower risk of haemorrhaging. If body has a sufficient number of platelets then they are at a low risk of haemorrhaging. For any reason your blood platelet count falls below normal, the condition is called thrombocytopenia. Because each platelet lives only about 10 days, your body continually renews your platelet supply by producing new platelets in your bone marrow. Thrombocytopenia can be inherited or it may be caused by a number of medications, chemotherapy or conditions such as liver disease or viruses. Whatever the cause, circulating platelets are reduced by one or more of the following processes: trapping of platelets in the spleen, decreased platelet production or increased destruction of platelets. Platelets, also called thrombocytes, are the smallest cells in the blood. These cells do not have a nucleus, are round or oval, flattened, disk-shaped structures, and are necessary for coagulation. Two tests that measure or count the number of platelets are the platelet count, which measures the number of platelets in the blood, and the mean platelet volume (MPV), which provides information about platelet size. A platelet count test often follows a decreased platelet count that was estimated from a peripheral blood smear . The platelet count is an important blood test because thrombocytopenia is the most common cause of bleeding diseases. This count is used to evaluate bleeding disorders due to liver disease, thrombocytopenia, and anticoagulant therapy . The test is also ordered for patients who have diseases associated with bone marrow problems, such as leukemia and aplastic anemia . The platelet count is expressed as the number of platelets per cubic millimeter (mm3) of blood. The body’s bone marrow doesn’t make enough platelets. Bone marrow is the sponge-like tissue inside the bones. It contains stem cells that develop into red blood cells, white blood cells, and platelets. When stem cells are damaged, they don’t grow into healthy blood cells. Many conditions and factors can damage stem cells. Ayurvedic literature reveals that papaya (Carica papaya) leaf extract has haemostatic and other medicinal properties 5,6,7,8,9. Testimonials have revealed the beneficial effects of papaya leaf extract in Asian patients who have dengue haemorrhagic fever 10,11. Dengue viruses, mosquito-borne members of the Flaviviridae family, are the causative agents of dengue fever. Dengue is the most important emerging viral disease of humans that in recent decades has become a major international public health concern. Dengue is found in tropical and sub-tropical regions around the world, predominantly in urban and semi-urban area. It is estimated that there are between 50 and 100 million cases of dengue fever (DF) and about 500 000 cases of dengue haemorrhagic fever (DHF) each year which require hospitalization. Dengue fever is spread through the bite of an infected Aedes aegypti mosquito. The mosquito gets the virus by biting an infected person. The first symptom of the disease appears in about 5-7 days after the infected mosquito bites a healthy person. Chemotherapy-induced thrombocytopenia (CIT) is a detrimental side effect of cancer chemotherapy. Zika infection is spread by mosquito bites from the Aedes aegypti mosquito. The same distinctive mosquito with white markings the also infects people with Dengue fever, yellow fever and chikungunya virus. Symptoms of Zika are similar to Dengue, including muscle and joint pain, fever rash and extreme fatigue, skin rashes, bloodshot eyes and severe headaches. Many people have only mild symptoms though and some may not even realize they have contracted the disease. Scientists are also on the verge of linking Zika infection to a debilitating condition called Guillain Barre syndrome. Researchers say they have found that persistent infection from the Zika virus can trigger a chain reaction, causing the body’s own immune system to attack its nerves and resulting in paralysis. Read more here. To increase platelet counts, consult the doctor to take a multi vitamin containing a high dose of vitamin A, B, C, D & K1/K2. also include the foods containing these vitamins in the diet. Take a lot of vitamin C supplement. Mainly vitamin C can obtain form fruits and vegetables as well. Because vitamin C is water soluble, it can be easily absorbed by the body and will immediately help in restoring the body’s platelet count. Sufficient intake of vitamin C and flavanoids from natural foods like lemon, broccoli, spinach, bell pepper and kiwi are also beneficial for low platelet counts. Some doctors advise consuming the white fibrous rind of orange as it contains high levels of flavanoids, which improves blood vessels. Other foods for improving platelet counts: Omega 3 – fatty acids containing food include fish, free range eggs, flax seed oil, tuna and wild salmon. Bee pollen, which is a source of amino acids, vitamins and other substances have an extremely beneficial effect on the process of haematopoiesis. Walnut cooked carrots, black sesame, squid, peanuts, lean meats and milk for promoting platelet count. Sesame oil has properties that raise platelet levels. Organic Papaya Leaf (carica papaya) diffused in Vegetable Derived non-GMO Glycerin 1:1 strength, non-GMO. Take 5ml (4-5 squirts) and hold under the tongue for up to 10 minutes, gargle with some water and then swallow. Take every 5 hours. 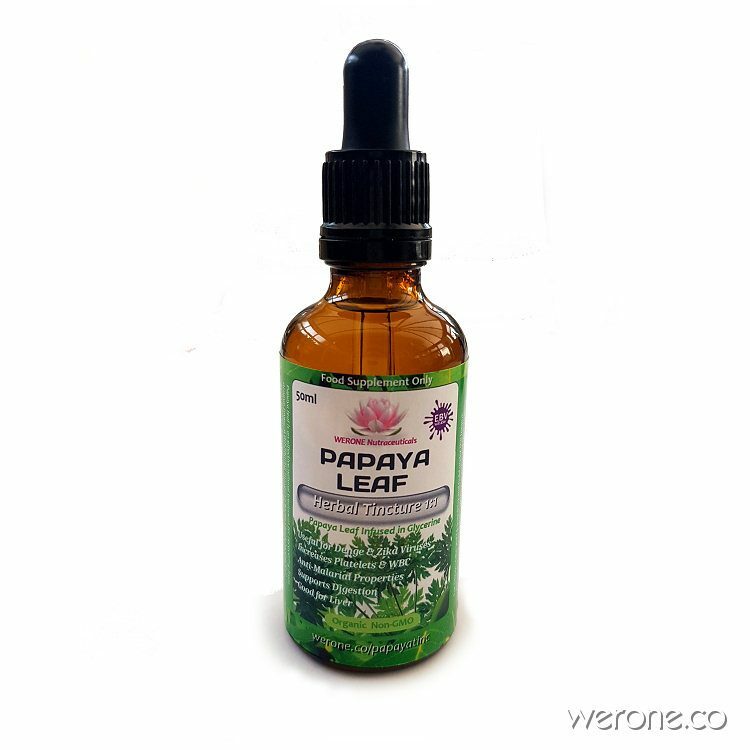 Caution: Papaya leaf extract should NOT be used during pregnancy. REFERENCES:- 1. Jiao Z, Deng J, Li G, Zhang Z, Cai Z. Study on the compositional differences between transgenic and non-transgenic papaya (Carica papaya L.). Journal of food composition and analysis. 2010 Sep 30; 23(6):640-7. 2. Aravind G, Bhowmik D, Duraivel S, Harish G. Traditional and medicinal uses of Carica papaya. Journal of Medicinal Plants Studies. 2013; 1(1):7- 15. 3. Ayoola PB, Adeyeye A. Phytochemical and nutrient evaluation of Carica papaya (pawpaw) leaves. IJRRAS. 2010 Dec; 5(3):325-8. 4. Hottz E, Tolley ND, Zimmerman GA, Weyrich AS, Bozza FA. Platelets in dengue infection. Drug Discovery Today: Disease Mechanisms. 2011 Aug 31; 8(1):e33-8. 5. Akram W, Khan HA, Hafeez F, Bilal H, Kim YK, Lee JJ. Potential of citrus seed extracts against dengue fever mosquito, Aedes albopictus (Skuse)(Culicidae: Diptera). Pak J Bot. 2010 Oct 1; 42(4):3343-8. 6. Esler D. Dengue: Clinical and public health ramifications. Australian family physician. 2009 Nov 1; 38(11):876. 7. Kadir SL, Yaakob H, Zulkifli RM. Potential antidengue medicinal plants: a review. Journal of natural medicines. 2013 Oct 1; 67(4):677-89. 8. Basu A, Jain P, Gangodkar SV, Shetty S, Ghosh K. Dengue 2 virus inhibits in vitro megakaryocytic colony formation and induces apoptosis in thrombopoietin-inducible megakaryocytic differentiation from cord blood CD34+ cells. FEMS Immunology & Medical Microbiology. 2008 Jun 1; 53(1):46-51. 9. Fink J, Gu F, Ling L, Tolfvenstam T, Olfat F, Chin KC, Aw P, George J, Kuznetsov VA, Schreiber M, Vasudevan SG. Host gene expression profiling of dengue virus infection in cell lines and patients. PLoS Negl Trop Dis. 2007 Nov 7; 1(2):e86. 10. Nivedita G, Sakshi S, Amita J, Umesh CC. Dengue in India. Indian J Med Res. 2012; 136(3):373-90. 11. WHO. 2. Dengue: Guidelines for diagnosis, treatment, prevention, and control in sub-Saharan Africa and 13 countries in South America. Geneva: World Health Organization; 2009, 2012. 12. Available At: http://www.whqlibdoc.who.int/publications/2009/9 789241547871_eng.pdf?ua=1. [Last accessed on 2014 Nov 07]. 13. Guzman MG, Halstead SB, Artsob H, Buchy P, Farrar J, Gubler DJ, Hunsperger E, Kroeger A, Margolis HS, Martínez E, Nathan MB. Dengue: a continuing global threat. Nature Reviews Microbiology. 2010 Dec 1; 8:S7-16. 14. Vaughn DW, Green S, Kalayanarooj S, Innis BL, Nimmannitya S, Suntayakorn S, Rothman AL, Ennis FA, Nisalak A. Dengue in the early febrile phase: viremia and antibody responses. Journal of Infectious Diseases. 1997 Aug 1; 176(2):322-30. 15. Levine SP. Thrombocytopenia: pathophysiology and classification. Greer JP, Foerster J, Lukens JN, Rodgers GM, Paraskevas F, Glader B, Wintrobe’s Clinical Hematology, 11th ed. by Lippincott Williams Wilkins, Philadelphia 2004:1529. 1999;1532. 16. Goldstein KH, Abramson N. Efficient diagnosis of thrombocytopenia. American family physician. 1996 Feb;53(3):915-20. 17. Young NS, Issaragrasil S, Chieh CE, Takaku F. Aplastic anaemia in the Orient. British journal of haematology. 1986 Jan 1;62(1):1-6. 18. Passweg JR, Marsh JC. Aplastic anemia: first-line treatment by immunosuppression and sibling marrow transplantation. ASH Education Program Book. 2010 Dec 4;2010(1):36-42. 19.George JN, Rizvi MA: Thrombocytopenia. Eds: Beutler E, Lichtman MA, Coller BS, Kipps TJ, Seligsohn A. Williams Hematology.6th ed. McGraw-Hill Co. New York. 2001: 1495-1539. 20. Neunert C, Lim W, Crowther M, Cohen A, Solberg L, Crowther MA. The American Society of Hematology 2011 evidence-based practice guideline for immune thrombocytopenia. Blood. 2011 Apr 21;117(16):4190-207. 21. Schmidt KG, Rasmussen JW. Kinetics and distribution in vivo of 111In‐labelled autologous platelets in idiopathic thrombocytopenic purpura. Scandinavian journal of haematology. 1985 Jan 1;34(1):47-56. 22. Tsai HM, Lian EC. Antibodies to von Willebrand factor–cleaving protease in acute thrombotic thrombocytopenic purpura. New England Journal of Medicine. 1998 Nov 26;339(22):1585-94.
infection. Viral immunology. 2006 Jun 1;19(2):127-32.
endothelial cells. The American journal of tropical medicine and hygiene. 2002 Apr 1;66(4):435-41.
of innate immunity. 2011 Feb 18;3(5):530-40.
electron microscopy. 2008 Jun 1;57(3):113-8.
the New York Academy of Sciences. 2009 Sep 1;1171(s1):E24-35. 29. Sekhon SS, Roy V. Thrombocytopenia in adults: a practical approach to evaluation and management. Southern medıcal journal-bırmıngham alabama-. 2006 May 1;99(5):491.